According to the International Organization of Motor Vehicle Manufacturers OICA, in 2016 the UK automotive sector recorded the highest output level since 1999 with 1,816,622 vehicles produced by 15 domestic manufacturers, an 8.0% year-on-year increase. According to the European Automotive Manufacturers Organisation ACEA, new passenger car registrations increased 2.3% and commercial car registrations 1.2% in 2016. Last year a record number of cars (1,354,216) was exported from the UK, amounting to 75% of total production. In H2 of 2016 export growth was mainly sustained by the pound depreciation in the wake of the June 2016 Brexit referendum vote. Exports continued to sustain automotive production growth in H1 of 2017 (up 0.8% year-on-year), according to the Society of Motor Manufacturers and Traders (SMMT). 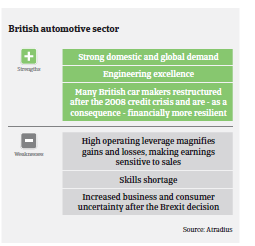 Given the on-going robust performance of the British automotive sector, any anticipated post-Brexit slowdown affecting demand or insolvencies has not yet materialised. However, according to the SMMT, investments in automotive production decreased sharply in H1 of 2017, to GBP 322 million, compared with GBP 1.7b billion in 2016 and GBP 2.5 billion in 2015, among growing businesses’ uncertainty over the Brexit negotiations outcome. While the proportion of premium and specialist cars, in particular, has grown in the past decade, leading to increasing demand from outside the EU, the EU market still accounts for 56% of UK automotive exports. A “hard Brexit” outcome (ending access to the single market and customs union) without any interim arrangement would severely hurt producers and suppliers alike. Leaving the EU could mean that increased tariffs would make producing cars in the UK more expensive. Under World Trade Organization (WTO) rules, there would be a 10% tariff on vehicles and 4.5% on components. The introduction of customs controls would hamper the just in time delivery of parts from EU suppliers, and lead to higher stocks, thereby increasing costs (on average, UK-made cars contain 60% of their components imported from the EU). In addition to any potential trade disruptions, the sector would lose benefits from EU funds for manufacturing research and development. Foreign-based car producers with operations in the UK could suffer from a deterioration in profits and an impairment in assets. Currency volatility is a serious issue. While the depreciation of the pound has helped exporters, it has also pushed up the cost of importing both vehicles and components (about 87% of domestic-sold vehicles and 65% of automotive components are imported). Any significant long-term cost increase is likely to have a negative impact on sales, unless dealers and manufacturers absorb a share of this increase, which would negatively impact their margins. At the same time, UK GDP growth is expected to slow down to 1.4% in 2018, which, together with the on-going insecurity over the Brexit negotiations outcome and rising inflation, could slow down domestic car sales and affect car retailers and producers alike. Payments in the UK automotive industry take 60 days on average. We have recorded an increase in notifications of non-payment over the recent months, mainly due to the fact that a large car part distributor went into administration late 2016, negatively affected by GBP depreciation and seasonal issues. 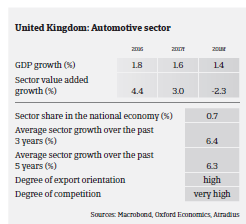 However, compared to other UK industries, the automotive sector’s default and insolvency rate is still good, with a stable short-term outlook. 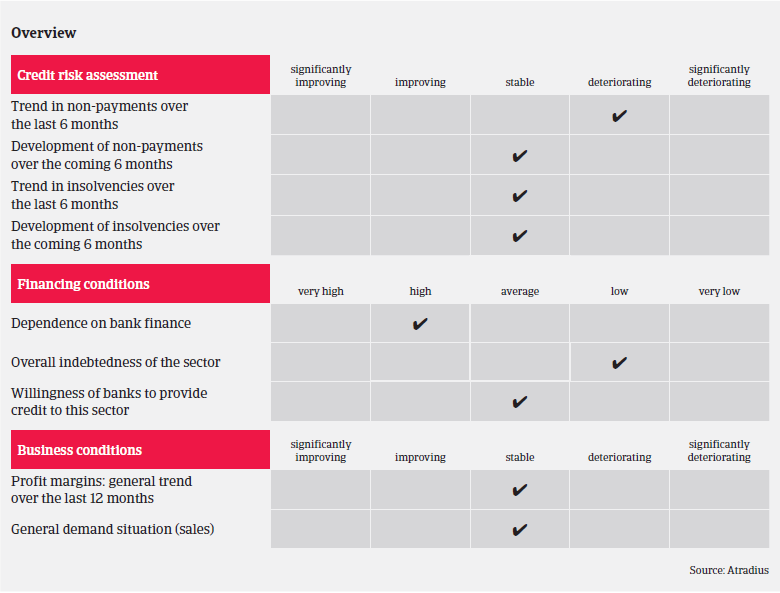 For the time being, our risk underwriting stance remains open towards most parts of the UK automotive sector, given the stable insolvency performance and reflecting the on-going robust car demand in the UK and in the eurozone. The true implications of the Brexit for the UK automotive sector still remain to be seen. However, we closely monitor the on-going Brexit negotiation process, particularly now that Article 50 has been triggered, as this will surely have an impact on the British automotive sector in the mid-term. Regular management information is obtained from buyers and customers, which enables us to analyse changes in risk dynamic effectively and act accordingly where appropriate.